How about Alfalfa in Chitradurga?? Alfalfa is used as an herb in alternative herbal treatments to treat ailments and problems such as menopause discomfort, cancer fighting and lowering cholesterol including several other discomforts. Though Alfalfa is hugely used in India, it is basically of western Asian and the eastern Mediterranean nativity. The common name of the herb Alfalfa is Lucerne of the pea family and is called Medicago sativa by the botanical name. Mainly the sprouts, stems, dried leaves and seeds are used for different purposes. Alfalfa is a slim bushy perennial with blue-green trifoliate leaves and mauveto purple flowers with seeds in sickle-shaped pods. Alfalfa lives from three to twelve years, depending on variety and climate. It resembles clover with clusters of small purple flowers. The plant grows to a height of up to 1 metre (3 ft), and has a deep root system sometimes stretching to 4.5 metres (15 ft). These characteristics make the herb very resilient, especially to droughts. It has a tetraploid genome. The plant exhibits auto toxicity, which means that it is difficult for alfalfa seed to grow in existing stands of alfalfa. It has also been recommended that alfalfa fields should be rotated with other species like corn or wheat before reseeding. The root nodules of Alfalfa contains bacteria, Sinorhizobium meliloti, as observed in other legumes with the ability to fix nitrogen, producing a high-protein feed regardless of available nitrogen in the soil and is considered as the highest yielding forage plant. This herb is extensively grown in different parts of India including Coimbatore district of TamilNadu,southernIndia. Though the primary use of Alfalfa lies in feeding for dairy cattle because of its high protein content, it has been used as an herbal medicine for at least 1500 years. Maintaining the ancient tradition of Ayurveda, Alfalfa is considered to be effective in treating various diseases. Ingestion of alfalfa seeds or sprouts may be associated with a decrease in blood cell production while the leaves and stems provide a good source of protein as well as vitamins and minerals. This herb contains organic acids, free amino acids, non-protein amino acids like canavinine, strachydrine, coumarins, isoflavonoids, saponins and steroids such as b-sitosterol, campesterol, stigamsterol and others. It contains vitamins A, D, E and K as well as chlorophyll and carotene and minerals such as potassium, calcium and magnesium. This herbal plant also contains plenty of fiber with anticholesterolemic properties. The high concentration of vitamin K found in whole alfalfa has beneficial effect on several forms of hemolytic disease. This herb is extensively used in Ayurveda and other parts of alternative treatments like Naturopathy, Homeopathy etc in all over India for its wide usage. The practitioners of alternative treatment use Alfalfa for its cooling, sweet, and astringent properties that cleanse toxins from tissues. Moreover this herb is diuretic, controls bleeding and lowers cholesterol levels and even influences hormones and the circulatory and urinary systems. In Chitradurga, new projects of sheep and goat rearing are being incepted. 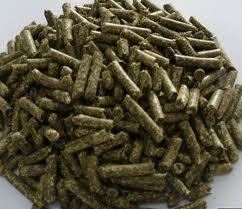 To fulfill the requirements about feeds for cattle, sheep and goats, Alfalfa is the best. This implementation will benefit 3 groups of agriculture. Farmers, feeds for livestock in cattle or sheep rearing and for beekeepers..
By migrating colonies to alfalfa field, we can harvest more honey in district along with sunflower and sesame. The recommendation from the department of veterinary to the dairy farm and sheep farm owners and support from the state govt. 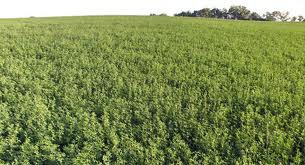 to farmers to promote growing alfalfa is required. 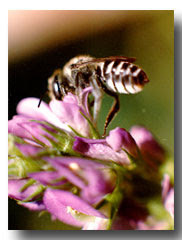 Alfalfa honey has a sweet mild flavor with a scent similar to bees wax. The honey ranges from a near clear to a light amber color. 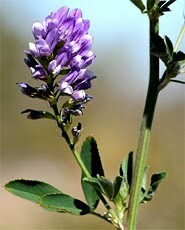 Alfalfa is an important honey crop in the western United States. Pollinating for onion seed production. As we know that, every 3rd spoon we eat is the contribution of honey bees. Over 95% of food crops are pollinated from bees. 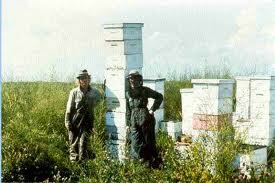 Keeping Bee hives in the farms will increase the production and yield of the crops. In Chitradurga(Karnataka State,India) farmers grow sunflower,safflower, red gram, Sesame and horticulture crops like pomegranate,mosambi, watermelon, lemon, vegetables etc.. All these crops require 100% pollination to get triple yield which is only possible from honey bees. 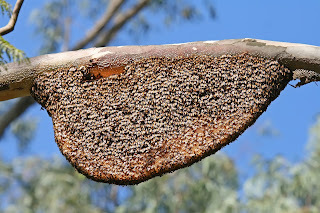 Intermittent rains and usage of some dangerous insecticides is the result of decrease in number of natural bee hives. If we keep the bee hives as shown above, we can get 100% pollination and will increase the farmer's estimated crop yield and thus the economy of the district will also increase. Especially in sunflower crops we can extract large quantity of honey which generates employment for the rural youth to produce honey and selling them.